Despite the advances in medical sciences, why we are not healthy. With all the technology at our disposal, why condition of our rivers continues to deteriorate. 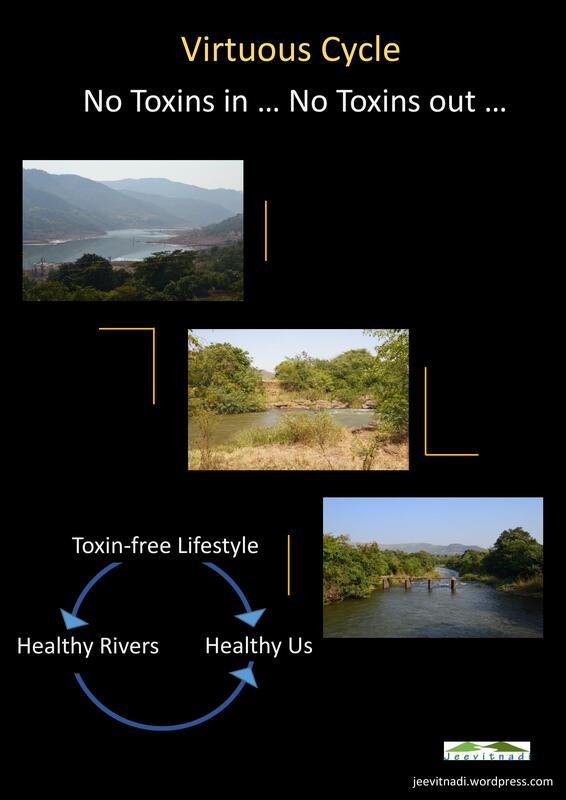 Ever wondered if there is any connection between river health and our health…. Here is a short clip on the subject..
Of the total pollution load in the river, Domestic wastewater contributes about 70% or more! What pollutes Domestic wastewater mostly? The toxic chemicals in most of the various domestic products we use daily! Domestic products like toothpaste, soap, shampoo, detergents, cosmetics etc. contain toxic chemicals like Sodium Lauryl Sulfate, Triclosan, Sodium Fluoride, Cocamide diethanolamine, Monoethanolamine, Triethanolamine Isopropyl Alcohol, Carmoisine, Benzalkonium chloride etc. Domestic wastewater carrying these toxic chemicals is discharged daily in sewers, subsequently mixing with rivers and other water sources as also the soil. Rivers have a self-cleansing property. But they are not equipped to cleanse or treat these toxic man-made chemicals. The contaminated river water is used to irrigate farms and grow crops. The toxic chemicals in this water are thus absorbed by the crop plants thereby entering the natural food chain harming living organisms and landing on our food plate as well. These toxic chemicals are linked to cancer, stomach disorders, skin diseases, respiratory diseases etc. What is harmful to the rivers is harmful to us! Since as much as 70% of river pollution is due to Domestic wastewater, it also means it is in our hands to eliminate as much as 70% of river pollution right from our homes! All we need – albeit gradually – is a change in lifestyle! The river flows from source to sea providing water to all life along its course. Nature has a superb mechanism in which the river has the capacity of self-cleansing its waters along its course. Now, we divert this flow of clean water from the river through our homes and release it back into the river after using. But the nature of the water that we release into the river from our homes is far from clean – in fact it is such that it cannot be treated / cleansed by the river. So all we need to do is – release such wastewater that can be treated / cleansed by the river! By using bio-degradable toxin-free domestic products! And therein lies the lifestyle change! Instead of using toxin-ridden domestic products, we need to switch back to using time-tested non-toxic and bio-degradable ones! By consuming such products, we not only safeguard our health but also automatically conserve our rivers and the environment in turn! And our wise forefathers had thought of exactly this aspect. They have already done the research and have brought into use such products that are best suited to our environment, using locally available, natural material. What are these products and from where to procure them? Jeevitnadi has put together an ‘Eco-friendly Family Starter kit’ with options for toothpaste, bath soap, shampoo, detergents, household floor and toilet cleaners. The idea is to get you started rightaway! The kit caters to the daily basic cleansing needs of a family and as the name implies, it is a starter kit. You can buy from the market later or prepare the kit items at home with the DIY-Do It Yourself- recipes we have given. Alternately you can buy the kit or individual items directly from Jeevitnadi volunteers or send us a mail to order or order online/on mobile with the Sustainable Living InstaDelight application. Details are provided at the end. You can also explore other bio-degradable options available in the market – and let us know too so we can upload them on our website for everyone’s benefit. Or – experiment away and come up with your own bio-degradable products that ensure both personal health and the health of our waterways! Let’s move towards a ‘Toxin-free Lifestyle’! Let’s Rejuvenate our Rivers & Safeguard our Health….! All details are given at the end. 1. Cleaner not to be used on marble floor. It may cause corrosion or leave white marks. All the kit items are natural, bio-degradable and non-toxic. Store all items in a cool and dry place in an airtight container to avoid contact with moisture.